Lava is the molten rock expelled by a volcano during an eruption. The resulting rock after solidification and cooling is also called lava. 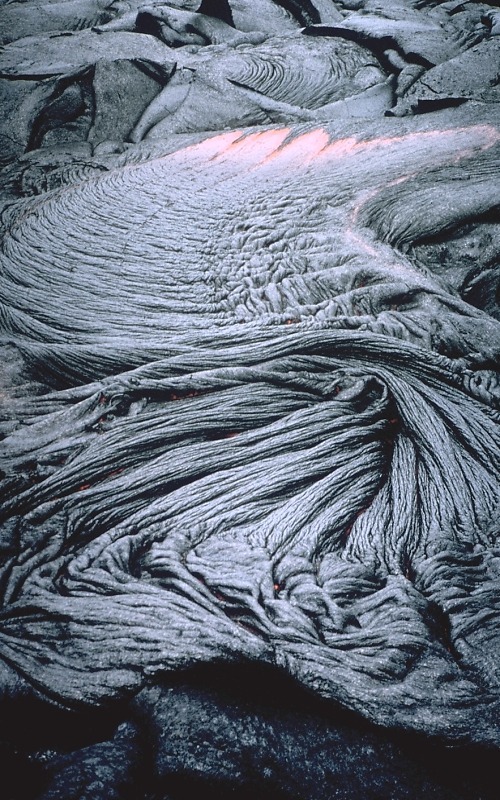 Pāhoehoe lava (found in Hawaii) has a smooth, billowy, undulating, or ropy surface. These surface features are due to the movement of very fluid lava under a congealing surface crust. The Hawaiian word, Pāhoehoe, meaning ”smooth, unbroken lava”. A pāhoehoe flow typically advances as a series of small lobes and toes that continually break out from a cooled crust. The surface texture of pāhoehoe flows varies widely, displaying all kinds of bizarre shapes often referred to as lava sculpture. Pahoehoe lavas typically have a temperature of 1,100 to 1,200 °C. What I found to be interesting was that the material is in a constant process and development. I further believe that this handling of the material could be something worth investigating.